Luxury Pocket Watch Skeleton Steampunk Mechanical Hand Wind Pocket Watch, Best Gift for Men by UP Dream at Femi Store. MPN: P1080C. Hurry! Limited time offer. Offer valid only while supplies last. 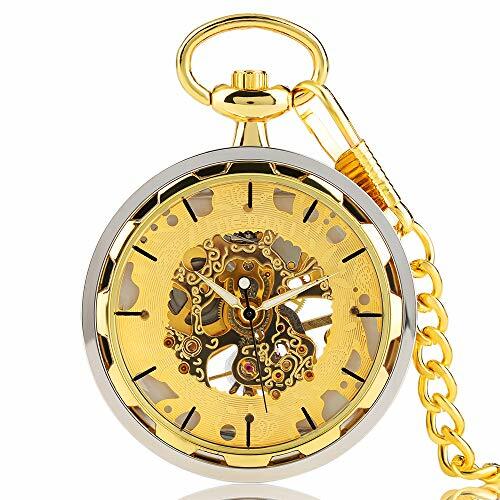 Product Description: MECHANICAL MOVEMENT - Without the battery, you can spin the button on the top of the pocket watch. Then it will work normally. SKELETON DESIGN - the style of this pocket watch 's design seems like steampunk, a cool-streetful and underground fashion. PRACTICAL - A trendy alternative to a common watch, our pocket watches for women and men can be put comfortably in the pocket and they are also connected with a chain as an attachment. GREAT ANTIQUE GIFT - An exquisite gift to friends, parents, kids in some celebrate days and occasions, such as wedding day, birthday, or chrismas. If you have any questions about this product by UP Dream, contact us by completing and submitting the form below. If you are looking for a specif part number, please include it with your message.